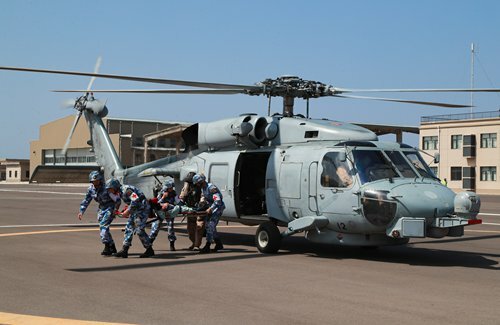 The Chinese People’s Liberation Army (PLA) Support Base in Djibouti conducted a medical rescue drill with the Spanish navy on Saturday, improving the capability of regional joint humanitarian rescue efforts. It is the first time that China’s Support Base commanded a team of helicopters to transport injured people and land in the support base’s airport, which explores a new type of joint overseas operation and provides valuable experience for humanitarian rescues at sea, as well as promotes communication and cooperation between the support base and the Spanish navy. The drill was conducted in the Gulf of Aden and simulated conditions in a hurricane disaster. The Spanish navy amphibious ship Castilla received a large number of injured people and sent the medical rescue request to China’s Support Base. During the four-hour drill, the Chinese medical team held an emergency meeting with the medical staff on the Castilla and established a joint medical team. The drill focused on procedures, such as emergency helicopter medical evacuation. Djibouti’s military staff and air staff were invited to watch the drill.